The Recme Scarab virus is a new version of the Scarab ransomware family. It has been detected in an ongoing attack that carries the new versions. Like the previous versions it is capable of inflicting much damage to the victim hosts. 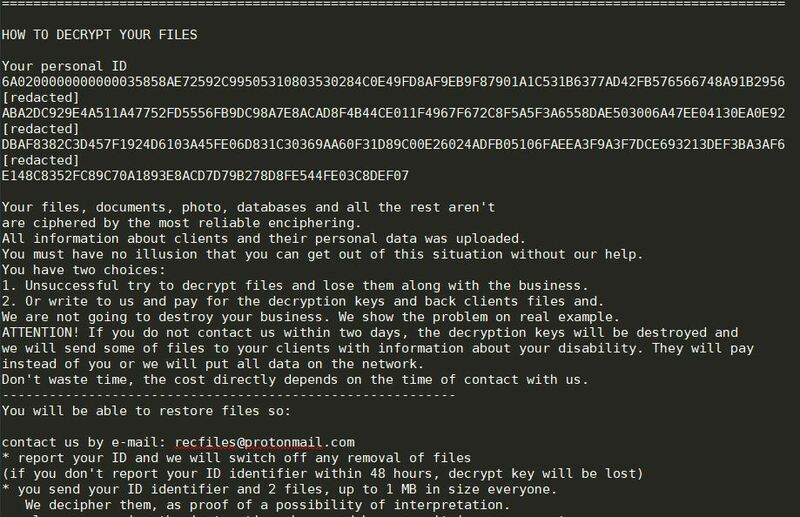 Short Description The ransomware encrypts sensitive information on your computer system with the .recme extensions and demands a ransom to be paid to allegedly recover them. User Experience Join Our Forum to Discuss Recme Scarab. Applications Installers — The criminals behind the Recme Scarab virus can create dangerous software installers by taking the legitimate files from the official vendor sites and modifying them with the malware. Often popular applications are targeted such as system utilities, productivity apps or creativity suites. Infected Documents — Using a similar mechanism the hackers can embed the Recme Scarab virus startup scripts in documents of different types: rich text documents, spreadsheets, presentations and databases. Strains associated with the Scarab ransomware family can also be spread via browser hijackers. They represent malicious web browser plugins that are spread using the relevant application’s extension repository. The criminals behind the plugins often use fake developer credentials and user reviews along with an elaborate description in order to fool the users into installing the malicious extensions. The hackers behind Scarab are incrementally creating several versions of the ransomware in order to track the different campaigns. The computer hackers behind the original Scarab ransomware are offering customization services or have provided the source code on the underground markets. This allows individual actors and criminal collectives to create their own versions of Scarab. Like other similar threats it can launch several modules depending on the targets. One of the first ones is typically the information gathering component. It is programmed to harvest strings that can reveal the victim’s identity and their hardware. Ransomware strains such as this one are widely used to expose the identity of the users, as well as commit identity theft and financial abuse crimes. Examples include taking the user’s name, address, telephone number, interests, locations and passwords found on the infected hosts. The harvested data can then be processed by a stealth protection module that is able to protect the target computers from dscovery by scanning for the presence of any security measures. The list includes all sorts of anti-virus products, firewalls, virtual machine hosts, debug environments and etc. They can be either disabled or completely removed depending on the specific instructions. Once the Recme Scarab has been deployed onto the target systems the virus engine will begin to cause various system modifications. Usually most of them are set against the Windows Registry. When the modifications are made to entries belonging to the operating system overall perforamnce may suffer. When such actions are done against individual user-installed software certain functions may be disabled. The Recme Scarab virus can be instituted as a persistent threat. The underlying engine reconfigures the boot options so that the Recme Scarab virus will be started every time the computer boots. It may also prohibit the users from entering into the boot recovery menu. It can block the startup of certain services and applications as well. By hooking to system services and user-installed applications the Recme Scarab virus can harvest the user input and interaction in real time. One of the most dangerous effects upon the target computers that an installed Recme Scarab virus can facilitate is a malicious network connection to hacker-controlled servers. They are used to spy on the victims, take over control of their machines and deploy other threats and additional modules. are ciphered by the most reliable enciphering. All information about clients and their personal data was uploaded. You must have no illusion that you can get out of this situation without our help. 1. Unsuccessful try to decrypt files and lose them along with the business. 2. Or write to us and pay for the decryption keys and back clients files and. We are not going to destroy your business. We show the problem on real example. instead of you or we will put all data on the network. Don’t waste time, the cost directly depends on the time of contact with us. You have 48 hours on payment. If you don’t manage to pay in 48 hours, then the price of interpretation increases twice. The price increases twice each 48 hours. To restore files, without loss, and on the minimum tariff, you have to pay within 48 hours. the personal identifier and we will communicate. If your computer got infected with the Scarab Ransomware ransomware virus, you should have a bit of experience in removing malware. You should get rid of this ransomware as quickly as possible before it can have the chance to spread further and infect other computers. You should remove the ransomware and follow the step-by-step instructions guide provided below. If your computer system got infected with the Recme Scarab ransomware virus, you should have a bit of experience in removing malware. You should get rid of this ransomware as quickly as possible before it can have the chance to spread further and infect other computers. You should remove the ransomware and follow the step-by-step instructions guide provided below. Threats such as Recme Scarab may be persistent. They tend to re-appear if not fully deleted. A malware removal tool like Combo Cleaner will help you to remove malicious programs, saving you the time and the struggle of tracking down numerous malicious files. Threats such as Recme Scarab may be persistent on your system. They tend to re-appear if not fully deleted. A malware removal tool like SpyHunter will help you to remove malicious programs, saving you the time and the struggle of tracking down numerous malicious files. Note! Your computer system may be affected by Recme Scarab and other threats. SpyHunter is a powerful malware removal tool designed to help users with in-depth system security analysis, detection and removal of threats such as Recme Scarab. 1. Install SpyHunter to scan for Recme Scarab and remove them. 2. Scan with SpyHunter, Detect and Remove Recme Scarab. Ransomware infections and Recme Scarab aim to encrypt your files using an encryption algorithm which may be very difficult to decrypt. This is why we have suggested several alternative methods that may help you go around direct decryption and try to restore your files. Bear in mind that these methods may not be 100% effective but may also help you a little or a lot in different situations. Note! Your computer system may be affected by Recme Scarab or other threats. Remove Recme Scarab by cleaning your Browser and Registry. Fix registry entries created by Recme Scarab on your PC. Combo Cleaner is a powerful malware removal tool designed to help users with in-depth system security analysis, detection and removal of threats such as Recme Scarab. Step 5: In the Applications menu, look for any suspicious app or an app with a name, similar or identical to Recme Scarab. If you find it, right-click on the app and select “Move to Trash”. Step 6: Select Accounts, after which click on the Login Items preference. Your Mac will then show you a list of items that start automatically when you log in. Look for any suspicious apps identical or similar to Recme Scarab. Check the app you want to stop from running automatically and then select on the Minus (“–“) icon to hide it. Remove Recme Scarab – related extensions from your Mac’s browsers. A pop-up window will appear asking for confirmation to uninstall the extension. Select ‘Uninstall’ again, and the Recme Scarab will be removed. When you are facing problems on your Mac as a result of unwanted scripts and programs such as Recme Scarab, the recommended way of eliminating the threat is by using an anti-malware program. Combo Cleaner offers advanced security features along with other modules that will improve your Mac’s security and protect it in the future. Hey !, I found this information for you: "Recme Scarab Virus (Scarab Ransomware) – How to Decrypt .recme Files". Here is the website link: https://sensorstechforum.com/recme-scarab-virus-scarab-ransomware-decrypt-recme-files/. Thank you.